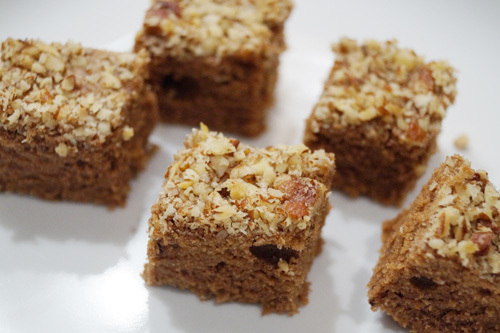 This delicious walnut fudge is sure to delight your guests on any occasion. Butter and almond flour will give it a smooth and rich texture to enjoy on a special occasion or during the holiday season. This fudge is chocolaty, delicious, healthy, and sweet - a beautiful remake of the old-fashioned fudge that your grandma used to make. Use cocoa powder, butter, and walnuts to achieve the perfect mix of flavors and texture. If you use trail mix, make sure you buy a low carb version to make this delectable, iconic dessert. You can make your own sugar-free powdered sugar using 1 cup powdered sweetener and 1 Tbsp corn starch or arrowroot powder. Or 1/2 cup xylitol and 1/2 cup sucralose - Combine them in a food processor or blender. Preheat oven to 350 degrees F (175 degrees C). In a large bowl, mix together the "sugar" and softened butter and beat with a mixer. Beat until well blended and very creamy. Add the eggs, flour and cocoa in that order. Spray baking pan with cooking spray. Spoon batter into the pan and sprinkle the chopped pecans/walnuts on top pressing them down gently. Bake for 25-30 minutes. Bake until a toothpick inserted in center comes out clean.